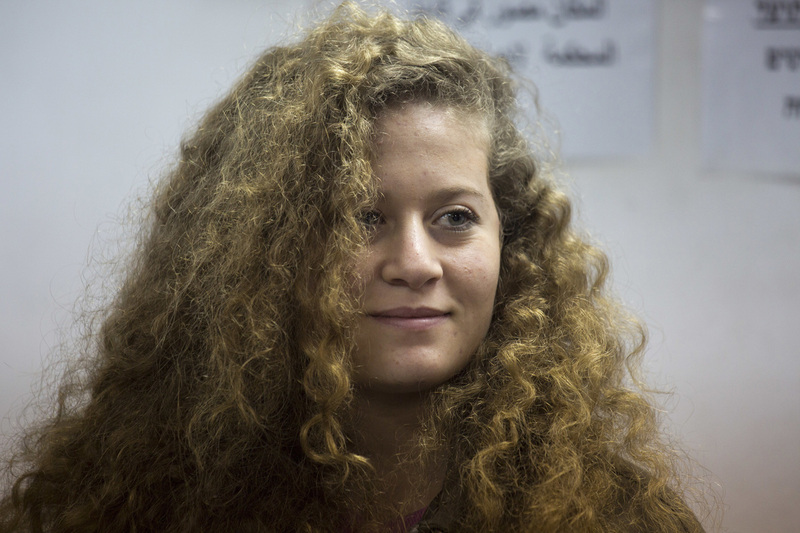 Military Trial Opens For 17-Year-Old Palestinian Activist : The Two-Way Ahed Tamimi is accused of assaulting Israeli soldiers outside her home. For many Palestinians, she has become a symbol of resistance. For many Israelis, she is a provocateur. Palestinian activist Ahed Tamimi was arrested and indicted after a public outcry in Israel when a video of her altercation with the soldiers, posted by her mother, went viral. The trial opened Tuesday in an Israeli military court for 17-year-old Ahed Tamimi. She is accused of assaulting Israeli soldiers outside her home in the Israeli-occupied West Bank. Tamimi was arrested and indicted after a public outcry in Israel when a video of an altercation with the soldiers, posted by her mother, went viral. But shortly after, the military judge ordered that the trial be held behind closed doors, and Tamimi was ushered out of the courtroom. The reporters and observers were ordered to leave, then allowed back into the courtroom as Tamimi's lawyer argued to keep the trial open. "I don't think this is in the interest of the minor" to have a large crowd in the courtroom, military judge Lt. Col. Menachem Lieberman ruled, clearing the courtroom of all but her family and lawyers. "What I think is that the court doesn't think it's good for the court to have all of you inside of it," Tamimi's attorney Gaby Lasky told reporters outside, "so you cannot carry on watching her trial." She said the military prosecutors did not object to an open trial. Tamimi is indicted on 12 counts, including assaulting an Israeli officer and soldier — as seen in the video — on Dec. 15 and for five additional events in which she allegedly assaulted Israeli forces, threw rocks at them, threatened them, obstructed them during their duties and participated in riots and incited others to do so. She could face several months or years in jail if convicted. An indictment also was filed against Nariman Tamimi, Ahed's mother, who uploaded the video to Facebook. In it, the soldiers don't appear to react to Tamimi's confrontation. The military said in a statement that it is charging Nariman Tamimi with using Facebook to "incite others to commit terrorist attacks." The altercation with soldiers happened shortly after Tamimi's cousin was shot in the head with a rubber bullet during a demonstration as he climbed a wall of a complex that Israeli soldiers had commandeered, according to Bassem Tamimi, Ahed's father, who is a well-known leader of protests in his village. Military prosecutors say Ahed Tamimi's slapping, kicking and punching of soldiers was assault. Bassem Tamimi recently told NPR that his daughter's confrontation is a natural reaction to a life of watching her relatives being arrested and killed. Lasky, Tamimi's lawyer, said Israel "wants to deter Ahed and other young people from resisting occupation nonviolently." In an interview with NPR, Israeli Deputy Prime Minister Michael Oren recently described the video as very personal for Israelis. Referring to soldiers, he said that "for an Israeli audience to see again and again photos of our children being beaten up and not have the army react in any way was very, very difficult for the society." Human rights advocates, including Human Rights Watch, have criticized Ahed Tamimi's pre-trial detention – now at more than 55 days. "Her case raises concern that Israel's military justice system, which detains hundreds of Palestinian children every year, is incapable of respecting children's rights," the rights group stated. Bassem Tamimi said he rejected the authority of the military court and did not expect justice to be delivered in his daughter's trial. B'tselem, an Israeli human rights organization, criticized the decision to close the trial to reporters. "The sudden concern for her rights is even less convincing considering their violation up till now, including her nighttime arrest, which was released to the media, her lengthy investigation in which she faced her interrogators by herself, and her remand in custody," B'tselem added. Lasky told reporters that in her preliminary arguments on Tuesday, she argued that the military court itself is illegitimate "because of the illegality of the occupation." She said Israel's occupation of the West Bank, now in its 51st year, is no longer temporary — because of the existence of Israeli settlements and lawmakers' efforts to annex Israeli settlement areas to Israel — and so therefore not legal. "Occupation is illegal, and so this court cannot be holding trial," she told reporters. A statement from activists representing the Tamimis said Lasky also argued there is "abuse of process" because Israeli authorities prosecute residents of the West Bank under two separate legal systems — civil courts for Israeli settlers and military courts for Palestinians. Israel argues that its presence in the West Bank is not illegal and that its disputed status should be determined through negotiations. It also argues the Palestinians have repeatedly declined Israeli offers of compromise on the territory. The prosecution read the indictment, but Ahed Tamimi has not yet entered a plea. The next hearing is scheduled for March 11, Lasky said.